Polo Black cologne is a scented beauty product that can be applied to your skin or clothes. Its combination of scents will impart a unique fragrance onto your skin that is suitable for both casual use and special events. Walgreens.com also has several other Polo fragrances including Polo Blue as well as Red, White and Blue. There are two distinctive scents in the Polo Black cologne collection that are sure to get you noticed. Polo Black by Ralph Lauren is the flagship of this line of fragrances. Its scent begins with a luxurious blend of iced mango and tonka bean, which unfolds into patchouli noir and finally blossoms into deep tones of Spanish sage and silver armoire. This classic scent can be worn with any attire to any event. Polo Double Black cologne is a slightly more earthy fragrance. It begins with a hint of mango, juniper berry, and pepper and develops into roasted coffee, nutmeg, and cardamon before solidifying into a rich woodsy scent. The Polo Black collection lets you you make a bold statement and a lasting impression regardless of whether you're in a casual or formal setting. It is important to properly apply Polo Black cologne to experience its full effects. Applying too much cologne at one time is likely to be overpowering. You want your natural scent to mingle with the eau de toilette, not be overcome by it. 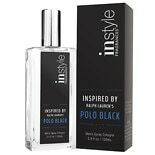 For a conservative yet noticeable touch, you can choose to lightly spritz Polo Black cologne onto your clothing or lightly dab it onto your neck, wrists, or other key points of your body. This cologne has an amazing, long-lasting scent that only requires a subtle application.